#10 Accomplish 10 things you didn’t think you could do: Roller Derby Tryouts! Every muscle in my body aches. I feel like an eighty year old man, clutching at arm rests to help myself sit down. The reason: Windy City Roller Derby League Tryouts. I’ve always admired roller derby divas but for some reason I’ve never had the courage to try out before now. So why know? Its the middle of winter, I haven’t worked out in ages, and I only found out about the tryouts last weekend, so that left me only a week to prepare… But something inside of me told me now was the time to give it a shot, while I have the excuse of this project to drive me to try things I didn’t think I could do. Trying out for roller derby definitely counts as something I didn’t think I could do. Part of the difficulty of getting into roller derby is that you need to buy your own equipment to really practice. But here in Chicago, they have a great program for recruiting and training new divas. They have Open Skate Nights and they loan out skates and pads to those who need it. The only thing you need is a Mouthguard, and don’t show up without it or they won’t let you on skates! So I went to open skate last Wednesday, and I learned a bunch of great tips and things to practice and prepare for from the captains. Roller Derby is very much run by the idea of “by the people for the people.” The league all-stars and captains make decisions collectively, and practice and training is also widely self-administered. 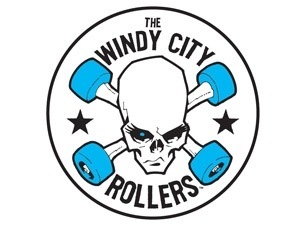 The Windy City Rollers is a women’s flat track roller derby league consisting of 4 home teams and 3 traveling teams. I learned I’d be trying out of the league pool team. If I happened to make it through tryouts, I’d get to attend league practices and improve with the hopes of getting drafted by one if the 4 teams. I learned I needed to practice my stops before Saturday, so I went to a roller rink called MLK down on the south side, for one more chance to practice. I worked on getting my speed up, t-stops, wedge-stops, and turn-stops, and by the end I was feeling pretty good about Saturday. I didn’t necessarily think I’d make it, but it was a relief to feel like I wouldn’t embarrass myself too much. My performance during stops was dreadful because I couldn’t force my legs to push into the floor hard enough to stop quickly and maintains balance. My jelly-legs caused me to fall at least 5 times, but I kept getting back up. I redeemed myself by ski-hopping over the track line 59 times in 30 seconds. Then, during 1v1 races I fell, causing the girl I was racing to trip over me and go down as well. Being the first one up after our topple, I got and maintained the lead for the rest of the race. I couldn’t believe I won! It felt good. 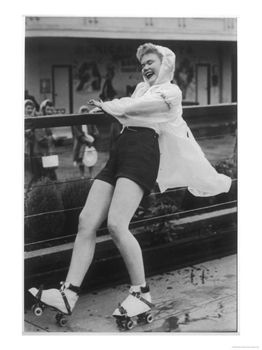 After all the skating exercises, the captains interviewed us individually, and I admitted that this was only my 3rd or 4th time on skates. They seemed impressed with what I was able to master in the short time I had. They asked about my availability and why I wanted to join their league, and I said that it seemed like the right time now that my schedule is more open. I left with a good feeling – even if I wasn’t quite skilled enough to make the cut this time, I met some great people and learned some valuable tips for improving my game. The ladies running tryouts were extremely demanding yet encouraging, and all my other tryoutees pushed themselves to the brink to show they wanted it, and for that they have all earned my respect as talented athletes. Today I just got the word: I’ll be seeing you around the track! I made it into the Windy City Rollers League draft pool! For the next 2 months I’ll get to learn from the best and try to beef up my game so I can get drafted by one of the teams. I’ll keep you guys updated on my progress and various inevitable bruises, and you’ll be the first to know if I make the draft! I could end up in one of four teams. Which one do you think I’m meant for?